A couple of blogs ago I wrote about Bob Brandt, a predecessor of mine at Brasenose College who was killed at Ypres in 1915. Back then his story set me pondering questions of anonymity and memorials. From the record of Brandt that his family, led by his mother Florence, had left in The Times, especially, I formed the impression of an unusually passionate determination to preserve his memory, one driven (I speculated) by the peculiar circumstances of his death and burial. A friend, Ralph Furse, wrote in the introduction to a collection of Brandt’s letters in 1920, “The surge of heavy fighting swept back and forward over the spot where he fell, and an unknown grave adds to the grief of some who loved him best,” although (as we shall see) there is reason to believe his place of burial was, in fact, known, at least at the end of the war. Since I first wrote about Bob Brandt, thanks entirely to Oliver Moody, who picked up the blog for a Times article, I’ve been able to make contact with living members of his family. A couple of days ago I visited Dr. Anne Evans, Bob Brandt’s great-niece, who as luck would have it has researched Brandt and many other members of her family, discovering lots of fascinating things which regrettably aren’t relevant here. (A taster, though: colonial Boston was largely constructed from timber supplied by the Brandt family business.) From Anne I learned that my hunch about the impact of Brandt’s death on his family had been in the right ballpark, but that there was a larger story to tell. That story is still very much one of anonymity and memorials, however. Dr. Evans showed me a lot of archive material relating to her great-uncle, and a thread running through it was the intense devotion of Bob Brandt’s mother to his memory, an echo of which I’d picked up in her scrupulous commemoration of his death in The Times every July. A particular collection of material relating to Bob, including a grainy photo of him breaking a public schools record for throwing a cricket ball, an achievement I’d read about in his Brasenose obituary, was remembered as forming a kind of shrine on the wall of her bedroom; other material may even have been buried with her. Florence Brandt’s bible also survives, interleaved with memories of her loved ones, often clippings from The Times. Again Bob has a special prominence. This is all impossibly poignant to read today, but Anne will I think forgive me for sharing her grandfather Edmund’s (Bob’s brother’s) experience of his mother’s state of mind, an awareness of being eclipsed by his better-looking, more brilliant, dead younger brother. As I said in my previous blog, what I find most compelling about working with the dry records of The Times or the census are these glimpses one gets of flesh-and-blood family dynamics. He had a talent for friendship, as they say, though, as Anne and I discussed, it was noticeably a talent for exclusively male friendship. 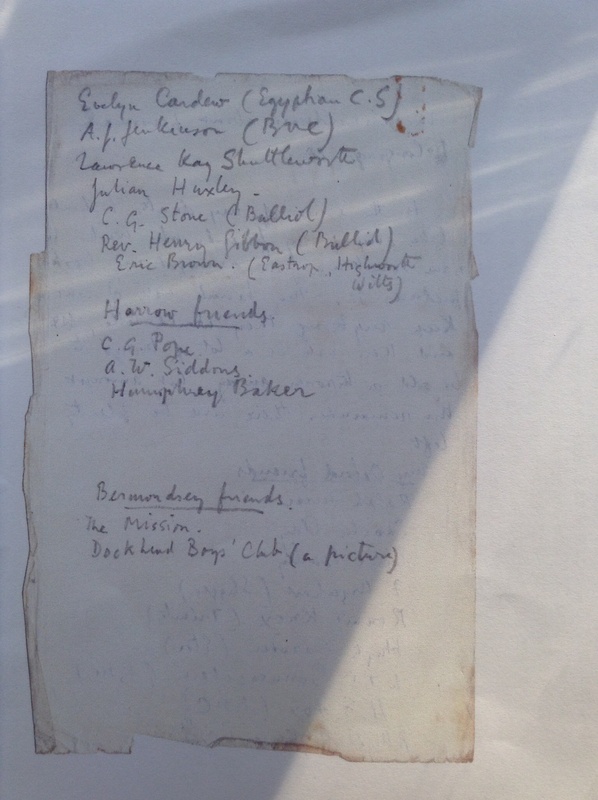 The following images confirm that talent in a different way, and I think I’ll be forgiven for not even attempting to introduce them, beyond saying that it is a list, in his own handwriting, of people to whom his personal effects should be offered in the event of his death. The names are worth a google; Brandt moved in some rarified social circles. Brandt did die, of course, and the name at the top of his list wrote the introduction to his collected letters. 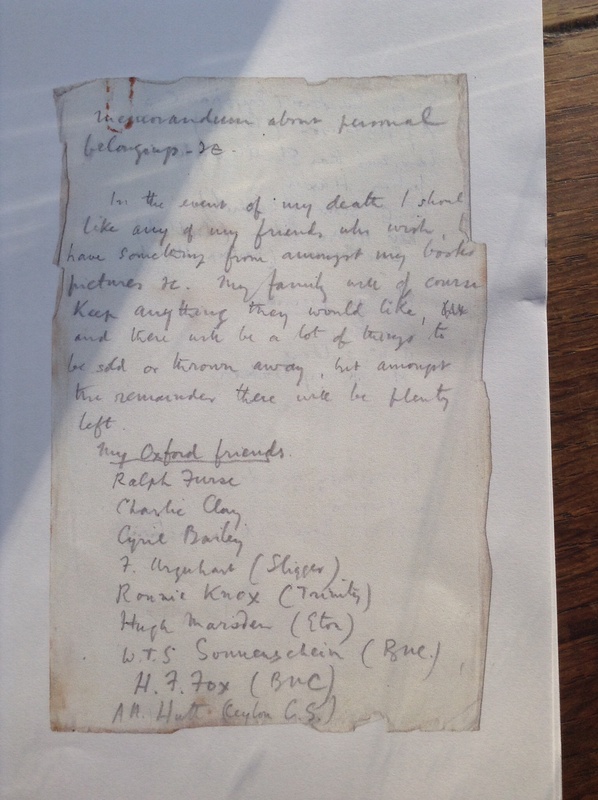 Either Fox or Sonnenschein (Stallybrass) of Brasenose wrote his obituary in the College magazine, and Bailey of Balliol wrote an appreciation. From his year of social work in London after leaving Brasenose College come the references to “The Mission” and “Dockhead Boys’ Club” in Bermondsey, well explained in this blog on John Stansfeld, who founded the Mission in Bermondsey: I wonder if anything of Brandt’s did end up on the wall there. For his family, however, my conversation with Anne confirmed how very heavily the matter of Bob Brandt’s burial and commemoration had weighed with them. In fact the issue turned out to be even more complex than I’d appreciated, enough to ensure that it has persisted, as yet without any resolution, ever since. A sketch of the situation is as follows. At the end of the war, or very shortly afterwards, Bob Brandt’s brother Edmund was taken by an officer of the Rifle Brigade, Brandt’s regiment, to see where he was buried at Talana Farm, a cemetery behind the British lines at Ypres that had been in use by French and then British troops from April 1915 to March 1918. The officer in question had known Brandt. 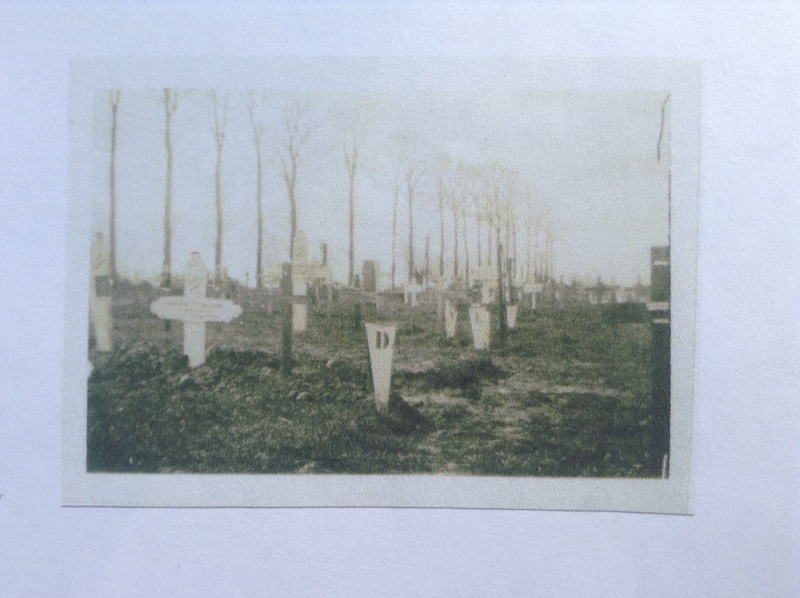 Photographs taken by Edmund, such as the one below, seem to focus on a particular burial, Grave 12, Row D, Plot 1, here marked with a dark wooden cross next to a white cross. The much more recent image below it shows the same scene once the original wooden grave markers had been replaced by the official stone memorials of the Imperial War Graves Commission. 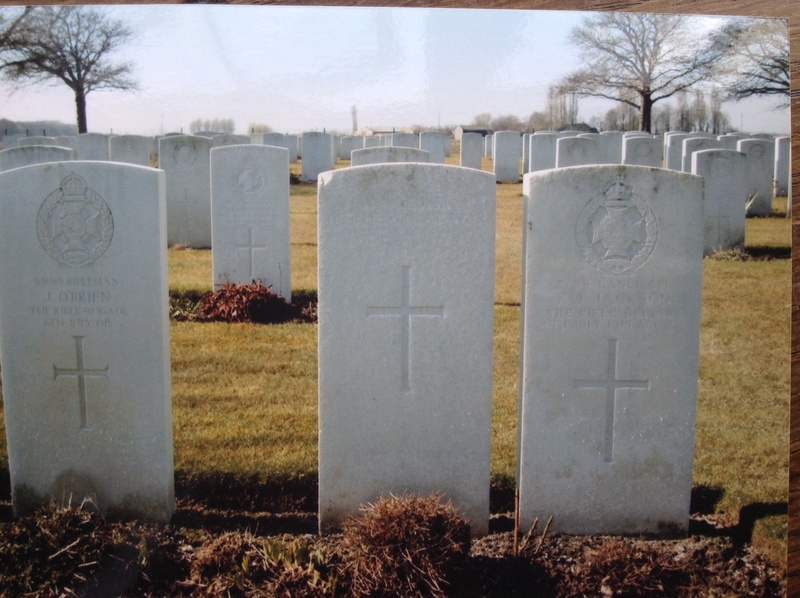 It’s easy enough to see that Grave 12, in the middle, is by now marked as anonymous (“A Soldier of the Great War, Known Unto God”), and flanked on both sides by named tombstones. The family believe, and Dr Evans has convinced me, that by the time the cemetery came to be restored by the Imperial War Graves Commission, any identifying text on the wooden cross shown to Bob’s brother had been lost, hence both the anonymous tombstone and Bob Brandt’s inclusion on the list of missing at the Menin Gate at Ypres. But Dr Evans is marshalling evidence for an approach to what is now the Commonwealth War Graves Commission to secure some recognition at Talana Farm that Bob Brandt is indeed buried there. It is far from the first attempt to do so, but it’s certainly going to be the most carefully researched. The family’s plan is that on July 6, 2015, the centenary of Bob Brandt’s death, they will congregate at the cemetery to inaugurate an inscription, even if all it says is that Bob Brandt’s body is strongly believed to lie in this cemetery. Bob Brandt has become far too real a character for me in the last few weeks for me not to wish Anne and her family all good luck in that campaign.